Mark your calendars for a wonderful close-to-home event to join in an Earth Day celebration for the Denison, Granville and Licking County communities. A variety of organizations, vendors and other participants will come together in celebration of our shared home, Earth. 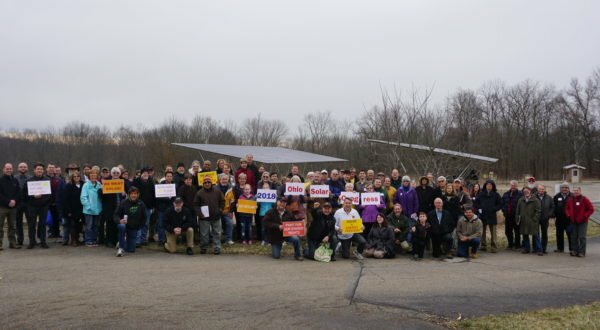 Solar supporters came from all across the state to attend the 2018 Ohio Solar Congress. The Ohio Solar Congress is a free public conference that brings together solar supporters from across the state to learn and discuss the current state and future for solar energy in Ohio. The day will include a series of presentations about solar technology and policy topics as well as ways to get involved with helping to grow solar in Ohio. We are excited to partner with the Voinovich School of Leadership and Public Affairs for the 2019 Ohio Solar Congress. Topics will include: solar 101, residential solar + storage, how to best advocate for solar, success stories, working through local barriers to solar, and much more! The event will conclude with a participatory open forum discussion for all attendees to discuss priorities and opportunities that solar supporters in Ohio should focus on in the coming year. Whether you are a solar homeowner, completely new to solar, or somewhere in between – this event is for you! Breakfast and Lunch will be provided for all attendees! Make a weekend out of the Ohio Solar Congress! We have secured a bloc of rooms at the Ohio University Inn (331 Richland Avenue, Athens, OH 45701 – walkable to the solar congress venue) for Friday March 8, the night before the congress, at a rate of $129 + tax. Rooms will be available until February 23. Reserve your hotel room here. Learn how solar works and how you can go solar by joining a local solar co-op. A panel of Voinovich School faculty, staff, students, and alumni will discuss lessons learned from small-scale, community, and utility solar energy research on and around campus. The Equity Committee of the Ohio Energy Table invites you to join them in a dialogue. This is the second of such talks that are happening around the state. Learn about Rural Electric Cooperatives and engaging with them to improve policy for members and solar generators. Check out different electric vehicles and talk with electric vehicle owners. Learn effective techniques in speaking the media, writing and utilizing new media. The Public Utilities Commission of Ohio determines what most Ohioans pay for electricity and how your solar is valued. Learn from one of our partner advocates how rates are approved. Learn how a local group is working to recycle batteries to create residential storage systems. 1. Volunteer videographer (2 – 3 volunteers) – we are looking for volunteer videographers with their own high resolution video camera to film presentations and footage during the event. *If you don’t have a video camera, but would be interested in Facebook live-ing presentations by filming them on your smart phone and streaming them live through our Facebook page, we are looking volunteers to assist with this as well! 2. Volunteer photographer (1 volunteer) – we are looking for a photographer with their own high resolution camera to capture great photos of the event throughout the day. To sign up for any of these opportunities, email Carra Cheslin at: getinvolved@solarunitedneighbors.org. Please feel encouraged to share this event with friends, neighbors, colleagues, or community organizations who may be interested!